We stayed at Crossfields for 3 nights for our son's wedding which was at a venue just a few miles away. The house was perfect for us with large rooms and patios for members of the family and wedding party to gather. The kitchen area was fabulous. Bedrooms and baths were lovely and very comfortable. Our only regret was not booking the house for several more days to relax in the beautiful setting after the wedding festivities were over. We stayed here over our wedding weekend, beautiful property, impeccably done, we'll be back! I hosted all my bridesmaids at this lovely home and it couldn't have been more perfect! All 9 bridesmaids comfortably got ready for the wedding here as well as enjoyed the entire weekend in the home. The kitchen was spacious and cozy the the decor was inviting and made me feel at home. I would gladly rent here again. We joined six other family members and stayed here to attend a wedding for a nephew. The eight of us had so much room and extra space we invited the mother and father of the groom over after the wedding for a relaxed "home cooked" dinner. The house is awesome, huge rooms, huge bedrooms, kitchen is to die for with all the upscale cooking pots and pans you need. I would stay here again in a minute. Very good service. I'm in town for conferences at the University from time to time and have gotten to know my way around. Will definitely go this route again. This was our first time spending a weekend in any type of a vacation rental and we can't wait to do it again! Thank you! The Belmont Ave Home was perfect!! It was so close to the Downtown Mall, and we didn't even have to meet anyone for a key. Everything was ready to go when we arrived and so clean. We loved having our coffee in the screened in porch every morning, and especially enjoyed the privacy we felt in this quaint neighborhood. I would recommend this home to anyone who wants to get away, whether for business or pleasure! Thanks Stay Charlottesville. My boyfriend and I decided to pass through Charlottesville at the end of our winter break and could not have been happier with this home. The Graves Street Magnolia was adorable and romantic, and so close to great restaurants on the Downtown Mall and in Belmont. This home was so clean and inviting, we could not have chosen a better place to spend some quality time together. 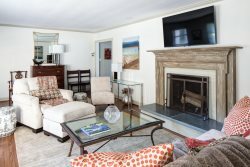 This was our second time at a Stay Charlottesville property, and both stays were great. The Rutledge home is beautiful, spacious, and comfortable, and though not right downtown (like the first property we stayed at), was still very convenient to all of Charlottesville. It is on a nice quiet street and the backyard is lovely. We appreciated being able to bring our dogs, and they enjoyed walking around the neighborhood and to the nearby Greenleaf Park. We'll be back for a Stay Charlottesville vacation soon! We loved our stay in the house. The beds were VERY comfortable and it was nice to have the big sectional couch to watch TV as a family at the end of the day. We felt the proximity to activities were wonderful. We were so happy you were able to adjust things to make it work to get us into that house - your customer service and responsiveness is to HIGHLY commended. Thanks again for getting us into the LEX house. Just a note to tell you how much we enjoyed our stay at Point Lookout!! The accommodations were just fine, the TV worked great, I could see my tennis matches, the views spectacular and the Texas Longhorns kept us company. David and Jannel were extremely hospitable, gave a barbeque set we used on our last night. Saw Montpellier, tasted wines, and toured the winery. Glad we could work out a price, and we thank you for all your help. We will recommend the place to our friends. We thoroughly enjoyed staying at the guest house. The neighborhood was nice and quiet and close to downtown and the shops/restaurants in Belmont. The guest house, while compact, has everything you need. The bed was quite comfortable and the kitchen well equipped. I would reccomend it to friends and family. And it was great that we could bring the dog too! I would recommend to anyone considering a visit to the Charlottesville area to stay at this property. Not only is it extremely comfortable, the privacy and quite location made my 15 night stay very relaxing. When walking my dog each morning and evening, I felt very safe and welcomed in the neighborhood. I passed many friendly faces on our short walks to the Downtown Mall and University where there are many great places to eat and shop. So, if youre either on vacation or a corporate relo such as myself, you will be doing yourself a favor staying at the Downtown Carriage house instead of some over priced hotel. We enjoyed the stay. We liked the location and the property was excellent. We would use your service again. It was great. We really just needed a quick night away and this did the trick. The room was nice and well maintained. Thank you. We enjoyed staying at the Tree House unit on First Street in Charlottesville. It was walking distance to the shops and restaurants downtown so the location was perfect. Directions for getting to the unit, parking and access were easy to use and worked perfectly since we didn't have to plan our schedule around meeting someone or picking up keys from somewhere else. The unit was quiet and very quaint. The bed, bath and living areas provided exactly what we needed, were clean and inviting and worked very well. There was plenty of room for the two of us and the space would have accommodated our two teenage kids had they accompanied us. Thanks again for our stay. When my family and I decided to stay in Charlottesville we knew we didn't want to be in a hotel. The Kenridge Carriage House was everything we could have hoped for. For a family that loves to have home cooked meals, the kitchen was a dream come true. The location was perfect, just five minutes away from downtown Charlottesville, and we even enjoyed the fireplace on the deck outside in January! I would recommend this home for anyone who wants to get away and relax in a beautiful home!